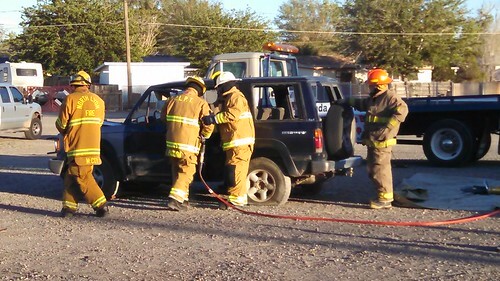 The North Lyon Fire Protection District, which includes the Fernley Fire Department, held an open house on Friday evening. Lisa (carrying travelswithkuma as usual) and I walked over to have a look. 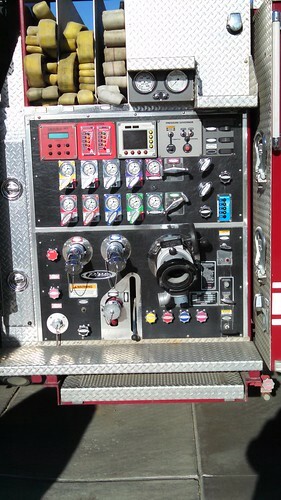 One of the engines was parked out front and Lisa asked me to take a picture of pump control panel. Inside, they served a barbeque and there were displays about volunteering for the department (the main reason for the open house, which was funded by a grant for attracting volunteers), how the paramedics work (interrupted because a call came in and they had to saddle up and roll), and a US Forest Service exhibit, which was like Old Home Week for me. Also, the USFS's mascot was there. 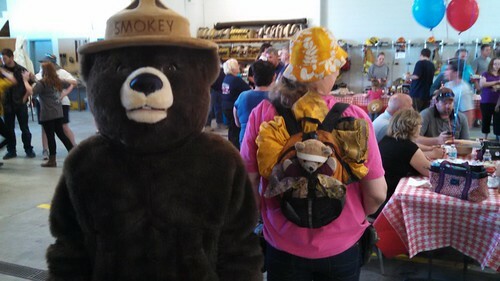 Kuma Bear got to meet Smokey Bear. Out back of the fire house, there was a demonstration of how they use the power tools (which were themselves a donation, because their ordinary funding wouldn't pay for them) to take apart a car to do a rescue. This was a combination of demonstration and training for new fire fighters, so it was somewhat more leisurely than had there actually been someone trapped inside a wrecked vehicle. The vehicle was a genuine wreck, though, donated by a local wrecking yard. Lisa and I spoke with the Chief, who remembers us (we're one of the few people who ever come to their meetings who isn't part of the department), and I'll be sending him pictures of how the local grocery store illegally barricades one of their doors during the late evening hours. It appears that there will be a proposal before the voters to increase the fire department property tax assessment by around $10/year for a typical home in this area, and I for one will be voting for it.